This is a Corp of Engineer Park. There are only two sites with 50A service, but they aren't full hookup. Six sites have full hook ups, but they are 30A, gravel pads, and require some leveling. There is only one pull thru and it's 30A. Only about 30% of the sites are "shaded." 1-15 are the better sites. 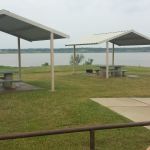 All sites have covered picnic tables and fire pits. There is no laundry facilities and no playground. 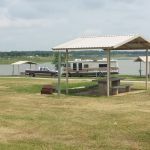 The campground does have two boat ramps and fishing piers. Good voltage and water pressure. The park gates are locked between 10 pm and 6 am. The bath houses leave allot to be desired - pit toilets and not all of them have showers. 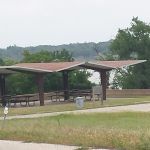 The trash dumpsters are small and not close to camping areas. This park is better suited for rigs less than 32 feet in length and only requiring 30A service. 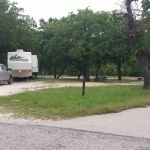 We camped at Copperas Creek COE in a Motorhome.